← @Mia_Melon: A Whimsical Feminine Collection. Find them ONE DAY ONLY, July 7th @local_E BAZAAR! 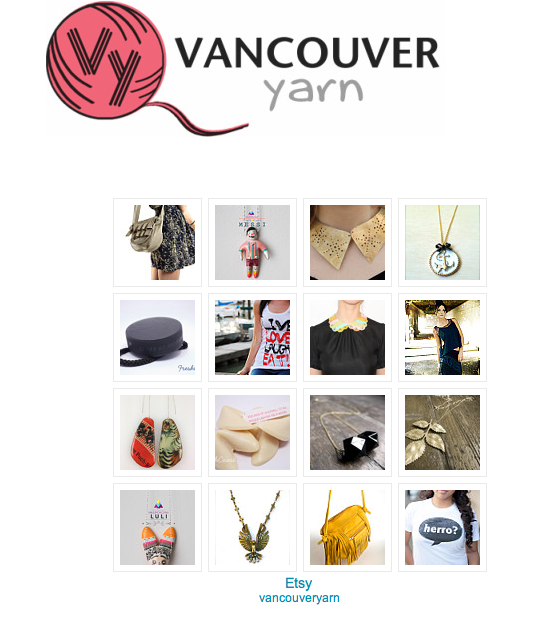 Vancouver’s online directory, Vancouver Yarn, has featured some of the local-E BAZAAR! vendors’ Etsy Shops on their website! Thanks Janna! Since 2008 Vancouver Yarn has been Vancouver BC’s online yarn directory providing resources to the public with a focus on helping people shop locally for their yarn and crafting needs. Vancouver Yarn is a resource website, not an online shop. We have listed all 27 yarn shops in the lower mainland and Vancouver Island with store hours and maps for those which are in Vancouver, BC. Our Classifieds section offers Craigslist feeds already tailored to search for yarn, knitting, weaving and spinning related supplies. Our links page offers links to local blogs, and online shops based in Canada many of which are in BC. Our front page usually features hand-made art and craft by local artists available for purchase through Etsy by the individual artists and designers. This entry was posted in Uncategorized and tagged #shoplocal, designer, Etsy, EtsyCA, local-E, online directory, Vancouver Yarn. Bookmark the permalink.